One glorious day in late August. The weather has been a gift-bright, sunny summer- and I’m sure that today will be a lovely day. It almost noon when me and my friends reached the lobby of Hotel Indonesia Kempinski. 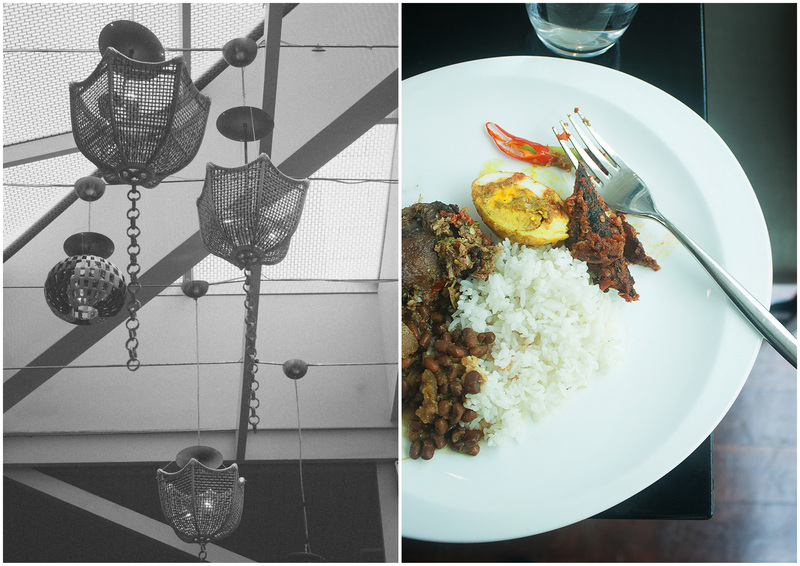 We went to Signatures Restaurant after we unwind for awhile in the hotel lobby. In the restaurant the waitstaff greeted us with a friendly and warm smile. 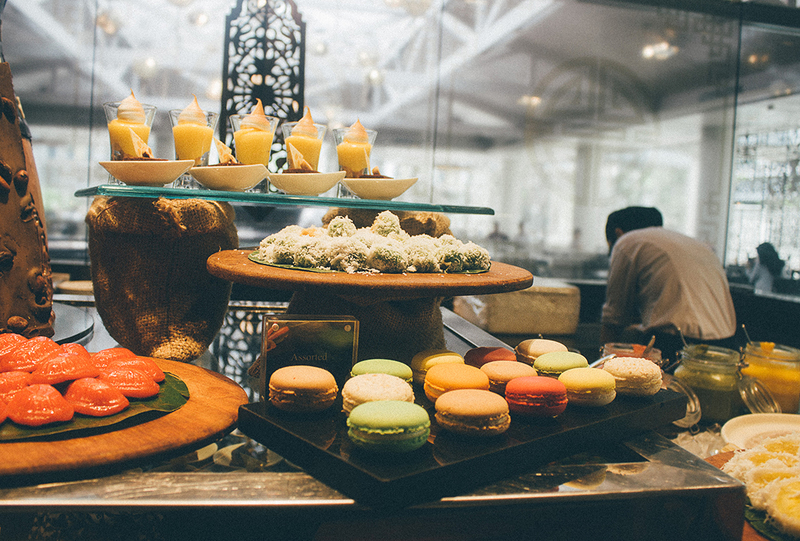 Even though there is a common thread between Balinese and Javanese cuisine, but Balinese food is more spicy, pungent and less sweet than Javanese cuisine. 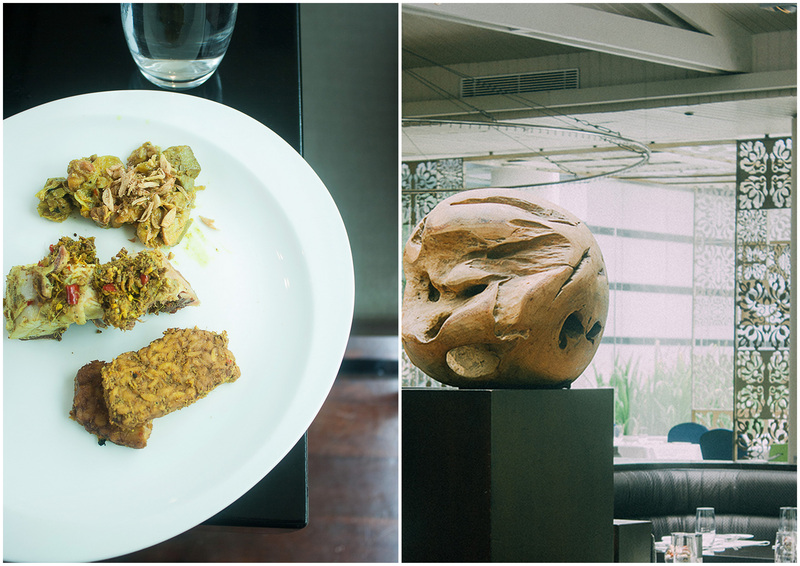 I personally think that Balinese cuisine is very unique, it really show the diversity of Indonesian cuisine. For their Balinese and Lombok cuisines program Signatures Restaurant invited Chef Ketut Sumerata from Bali as their guest chef. No dessert as an appetizer today! Thanks God, I could control myself. After check all the Balinese and Lombok cuisines (and take some pictures) I opted for pelecing kangkung and Sate lilt, while my friend take srombotan, jejeruk ayam, and ayam sambal matah. Sate Lilit (Mixed Seafood Satay)- Lilit literary means to twist or to coil. Sate lilit can made from chicken, pork, beef, or seafood. 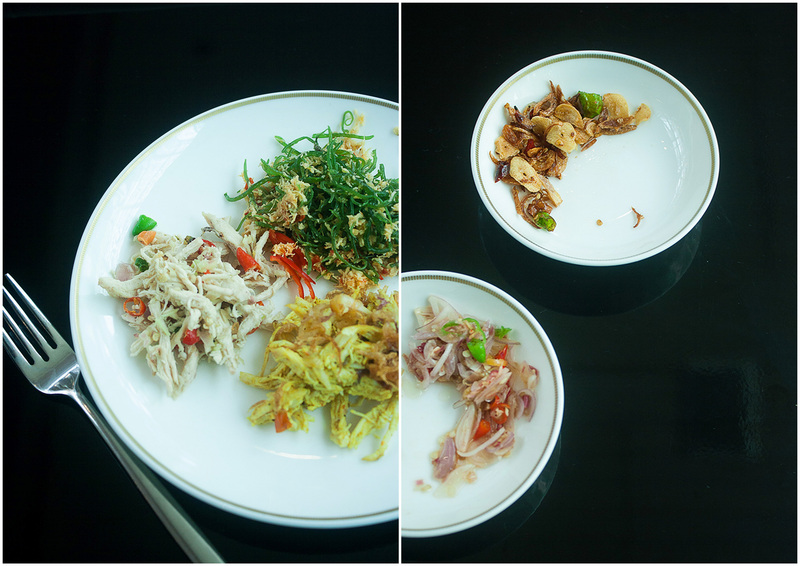 In this version Chef Ketut use mixed seafood. The minced seafood then combined with bumbu like shallots, ginger, lemongrass, chilli, shredded coconut, and thick coconut cream, and moulded onto lemongrass sticks. This fish stick then grilled over the coals, and it give it more nice aroma. Plecing Kangkung (Morning Glory with Chilli Paste)- Plecing kangkung is a Sasak (ethnic group) staple vegetable dish. 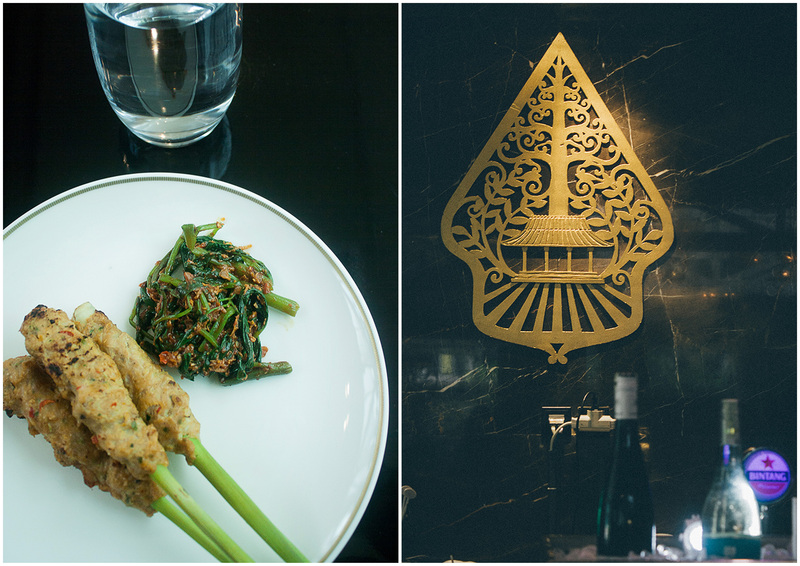 Fresh blanched kangkung served with a pungent sambal of chillies, shallots, terasi (shrimp paste), and tomato. This blanched kankung and sambal plecing then served cold at room temperature. Srombotan (Boiled Mixed Vegetable Spicy)- I saw Signatures restaurant served two kind of srombotan that day. First one is mixed of boiled vegetables like cabbage, green beans, and bean sprouts with spicy grated coconut. We didn’t try it because it look very similar with Javanese urap. We tried the other srombotan and this made from seaweed or green algae. The blanched seaweed is mixed with spicy grated coconut and fish broth. 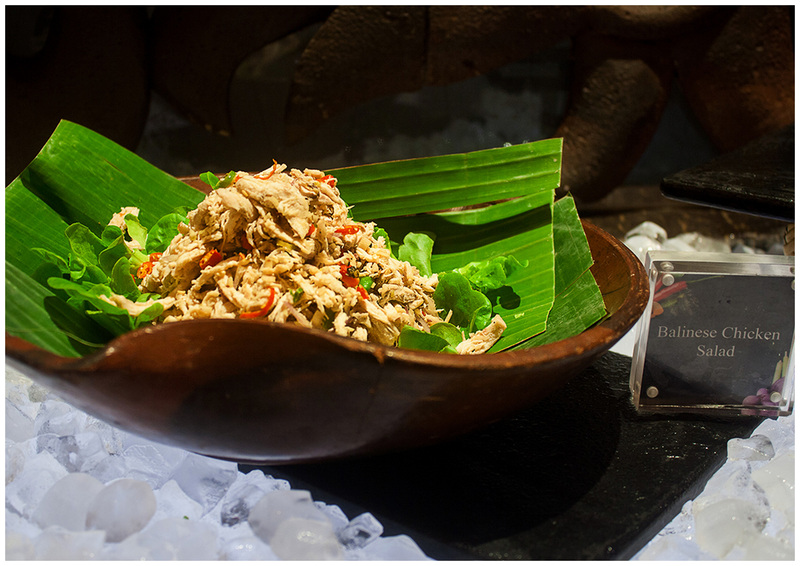 Ayam Sambal Matah (Balinese Chicken Salad) and Jejeruk Ayam (Chicken Salad in Coconut)- Ayam sambal matah or Balinese Chicken Salad is a shredded poached chicken served with sambal matah. Jejeruk ayam also shredded chicken, but it served with spices and grated coconut. 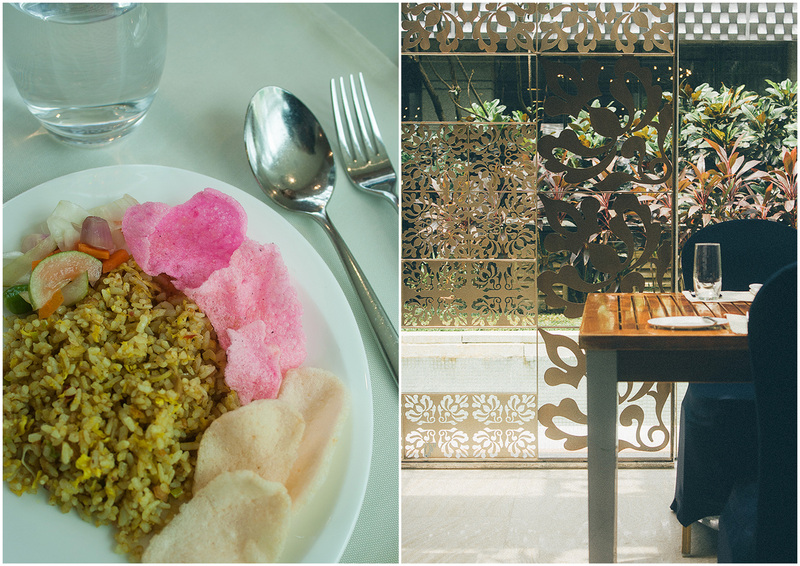 Next food is Nasi Goreng Bali (Balinese Fried Rice). Fried rice is a most popular food in Indonesia and I believe every region in Indonesia have their own version and this Balinese fried rice have similar aroma with Middle Eastern rice dishes. Ayam Betutu (Slow Roasted Chicken with Balinese Spicy)- Betutu is a classic Balinese dish, consisting a whole chicken or duck stuffed with spices and sometimes cassava leaves, and wrapped tightly in banana leaves or betel-nut bark before it’s baked or buried inside blackened pyramids-made of rice husks. According to Vivienne Krueger in her book Balinese Food: The Traditional Cuisine & Food Culture of Bali in Balinese betutu means chicken fillet, but according to Wall Street Journal article the term of betutu is refers to the use of rice-husk. Tempe Basah Genep (Braised Soya Bean Cake in Balinese Aromatic Spices)- Fried tempe or soya bean cake cooked in a Balinese aromatic spices over low heat. Telur Bumbu Bawang Jahe (Eggs in Aromatic Spices)- Hard-boiled eggs deep fried, and then served with Balinese aromatic spices. This egg dish is look yellowish and the taste of sauce almost same with tempe basa genep but with more heat from ginger. When I first saw this egg dishes it look similar with Taluh Mepindang or marbled eggs in Balinese spices.Sambal be tongkol (Fish with Sauce in Balinese Style), a chunk of fried tuna doused in spicy chilli sauce. This time I only take Pisang Rai for dessert. 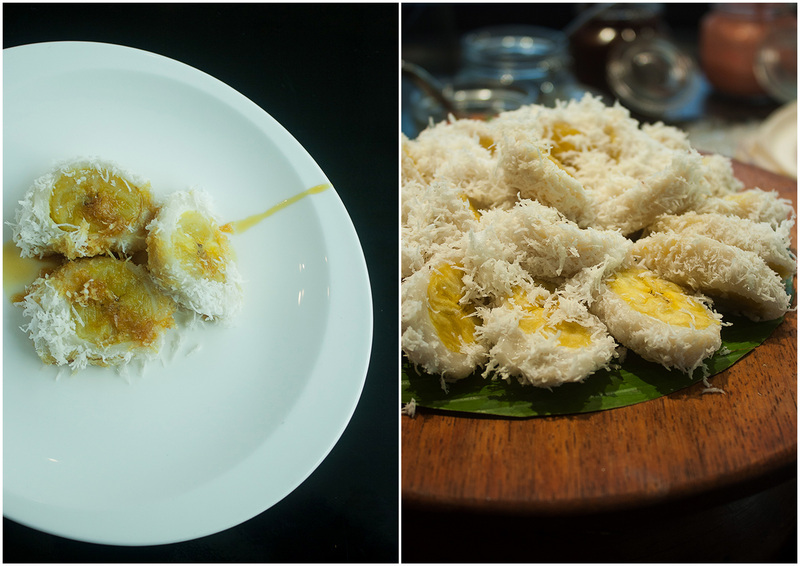 Steamed banana wrapped in rice flour mixture, then boiled or steamed and rolled in freshly grated coconut and served with a palm sugar sauce. I love because the banana is not too ripe and the palm sugar sauce make it more delicious. 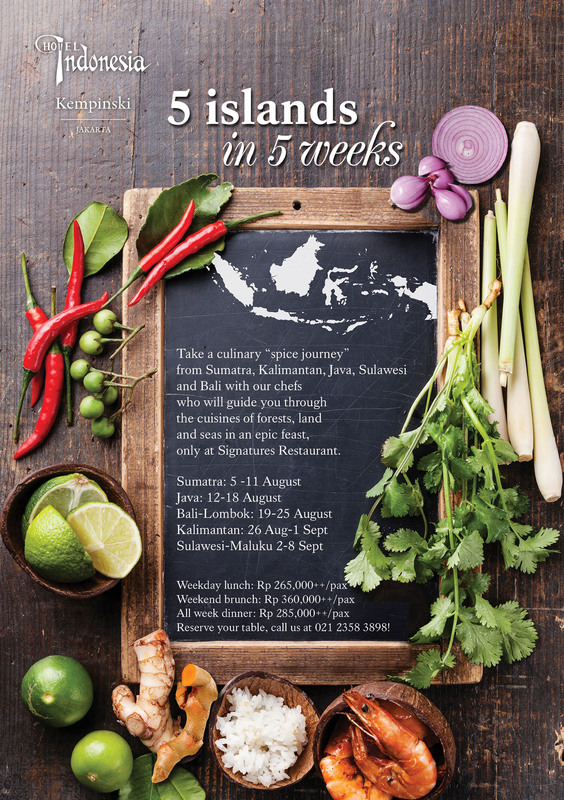 If you want to taste Bali-Lombok menu and all other Indonesian dish, enjoy the tasty menu for only Rp.265,000++/pax for weekday lunch, and Rp.360,000++/pax for weekend brunch, and all week dinner Rp.285,000++/pax. Beside Balinese and Lombok cuisine Signatures Restaurant also served many other food like Japanese, Western food, and Asian. They also have promotion discount if you BCA Credit Card.